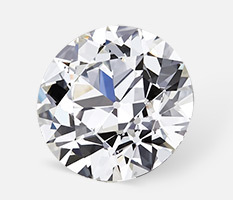 The Canera European Round or CER is a high performance Old European Cut (OEC) round diamond. The CER’s charismatic reflective properties can be attributed to its wide facets that reflect broader flashes of light compared to modern round brilliant diamonds. The CER surpasses antique Old European Cut diamonds in physical and optical symmetry and in light performance due to its optimal proportions and tuned facet design. The Canera European Round is a high performance Old European Cut diamond that can be found exclusively at VictorCanera.com. Old European Cut or OECs were round diamonds cut from about the 18th century onwards and was a popular cut during the Victorian, Edwardian and Art-Noveau periods. Some characteristics of Old European Cut diamonds are their small tables, steep crown angles, low percentage lower girdle facets and their large polished culets. These antique gems are sometimes described as "being full of character", and can have amazing brilliance and fire for an antique stone due to their high crowns and small tables. Their broad pavilion facets can "light up" (although asymmetrically) and reflect back amazing colors and pastels back at the viewer. Looking into these diamonds can be akin to looking into a crystal ball with light reflections from large broad facets found throughout the stone. At times a beautiful "Kozibe effect" occurs from the polished culet being reflected back throughout the crown. Modern day fans of Old European Cuts are true diamond connoisseurs and their passion for this antique diamond is clearly evident. The OEC though went through a transition in its design through the centuries. This transition involved the lengthening of the “Lower Girdle Facets”, gradually larger tables, shallower crowns and progressively smaller culets. This transformation and subtle changes to the OEC diamond's design led to the development of the Modern Round Brilliant Diamond. For this reason many Old European Cut diamonds polished during this transformation are termed "transitionals". As with our Canera Antique Cushion, the Canera European Round grew out of our dissatisfaction with the available Old European Cut diamonds in the marketplace today. The vast majority of Old European Cut diamonds presently available are diamonds handed down over the decades and centuries from their original owners. As beautiful and charming as these stones can be, they suffer from numerous shortcomings due to being manufactured decades, sometimes centuries earlier. Antique OECs can quite often be extremely out of round with an asymmetrical shape, bordering on a cushion shape on one or more sides. Furthermore, these stones usually have a very crude Cut (one of the most important of the 4Cs) with haphazard symmetry and polish. It is quite commonplace to see a “Fair” or “Poor” GIA symmetry or polish grade given to these stones which would be a fatal flaw in a modern diamond. Many antique OECs stones exhibit “extremely thin” girdles in areas. With usage and the resulting wear and tear over the years, many of these diamond have countless chips, abrasions and scratches on their girdles and\or elsewhere in a stone. Antique Old European Cuts are also devoid of the modern understanding of “Optical Performance” or Light Performance that occurred with the advancements of computers and 3D modeling. The light interactive properties of these old cuts can therefore be quite poor. Without light performance being taken into account, antique OECs can have light leakage or obstruction. Light leakage can be exhibited is the phenomenon of light passing through a diamond. This can cause a person to see through a diamond and see whatever is behind the stone such as skin or another background. Obstruction on the other hand occurs when a diamond reflects back a viewer’s shadow and causes areas of darkness in a diamond. While a little obstruction can have the positive result of yielding contrast in a stone, heavy obstruction under the table can cause the diamond to be dark and “lifeless” in the center. Old European Cut diamonds are also extremely scarce in higher colors. It's a rare sight indeed to see an OEC in the colorless Color ranges. Suffice it to say that searching for a true antique OEC in the "colorless" or even "near colorless" color ranges, which has a relatively good cut and adequate optical performance is an elusive almost unattainable goal. Until now. With the aim of vastly improving the performance and ultimately the visual beauty of antique Old European Cut diamonds we began to design a new OEC inspired diamond. The research and development phase entailed the close scrutiny of antique Old European Cut diamonds. Our goal was to recognize the characteristics that made Old European Cuts beautiful and also their areas for improvement. Many prototype diamonds were manufactured allowing us to closely examine the optical symmetry and light performance of our design. With the input of AGS Laboratories and after countless hours spent in research and development, the Canera European Round OEC diamond was born. Light Performance An important improvement over historic OECs with the Canera European Round diamond is Light Performance based on the ground breaking research of AGS Laboratories. The CER was designed with the input of AGS Laboratories. We'd like to thank Peter Yantzer specifically for his help during the development stage of the CER. Canera European Rounds are polished specifically for optical performance, in fact it’s part of its inherent design. While AGS Laboratories does not yet provide Cut or Light Performance analysis for Old European Cut Diamonds or derivative designs like the Canera European Round, we estimate that the CER would fetch and Ideal grade for Light Performance. This estimate is based on our own analysis of these stones and their resulting ASET imagery. We therefore note an Ideal (Estimated) score for Light Performance and Cut for the CER. The CER reflects light emanating from preferred sources of light (ASET Red & Green) back at the viewer with minimal obstruction (ASET Blue) or light leakage (ASET White). The optical characteristics of the CER will cause the pavilion facets to “light up” and reflect back surrounding light whether it be the pastels from the sky or other surrounding light creating a beautiful color pattern visible through the table of the diamond. Craftsmanship A heavy emphasis is placed on the craftsmanship aspect of the Canera European Round diamond. The CER consistently fetches top grades in polish and symmetry by AGS Laboratories which is considered to be one of the most critical labs in the analysis of craftsmanship in diamonds. We note that the Canera European Round diamond is polished by some of the most talented diamond polishers in the world using the latest polishing technology armed with centuries of accumulated knowledge in diamond polishing. We invite you to view our current offering of loose Canera European Round Diamondsto see how our vision of a New European Cut diamond has become a reality in the CER. If you have any questions or concerns about the Canera European Round, diamonds in general, or anything else that comes to mind please Contact us or Call (888)860-6430, we will be happy to assist you.